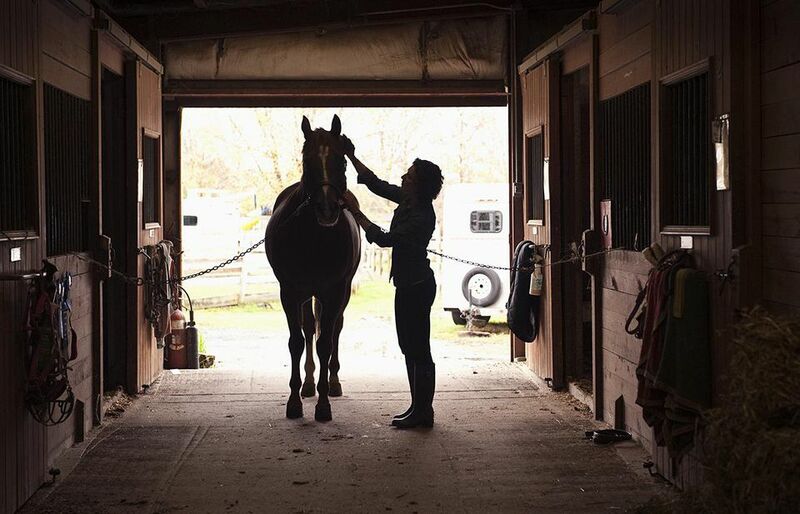 Grooming is an activity that is enjoyable for both you and your horse. It is also a good opportunity to check for injuries and irritations. Try to make grooming a daily habit. It is an absolute must before riding. Grit beneath the saddle or girth or cinch will be uncomfortable for your horse and could cause saddle or girth sores. Start from the left or right of your horse. These instructions assume you will start on the left side, but as long as you cover the whole horse, it does not matter. Have your grooming tools arranged in a convenient, safe place. A wide bucket may be cheapest and easiest to put your brushes in, although there are lots of grooming boxes on the market that keep your tools organized and handy. A curry comb or grooming mitt. A body brush with fairly stiff bristles. A mane and tail comb. Plastic causes less breakage than metal ones. A fine soft bristled finishing brush. A clean sponge or soft cloth. Hoof ointment if recommended by your farrier. Don’t sit your bucket or box too close to your horse where he could knock it over, or where you might trip over it as you move around your horse. Also have your horse securely and safely tied either with cross ties or with a quick release knot. If your horse seems uneasy about grooming, there may be things you can do to make it more comfortable. Cleaning out your horse’s hooves is very important. Slide your hand down the left foreleg. Squeeze the back of the leg along the tendons just above the pastern and say ‘up’ or ‘hoof’—whatever your horse is trained to respond to. Hold the hoof and with the hoof pick pry out any dirt, manure or anything else lodged in the frog or sole of the foot. Check for any injury and signs of thrush, grease heel, or other problems. Take note of any cracks in the wall of the hoof so you can consult with your farrier as to what should be done. Gently place the foot back down on the ground and continue until all four feet are done. Starting on the left side or ‘offside’ use your curry comb or grooming mitt to loosen the dirt in your horse’s coat. This step is where you remove any mud, grit, dust and other debris before trying to put a real shine on your horse’s coat. Curry in circular sweeps all over the horse’s body. Be careful over bony areas of the shoulders, hips, and legs. Use a light touch in these areas. Many horses are sensitive about having their bellies and between the back legs brushed (some love it). Be careful in these areas to use a light touch. Some horses are more sensitive skinned than others to adjust the pressure on the brush according to what they seem to enjoy. If your horse reacts by laying back his ears or swishing his tail in agitation, he is telling you that the brushing is too vigorous. As well as currying, you will also be looking for any skin lesions or wounds. If you find anything, you’ll want to assess the injury and decide if you want to treat it yourself with something out of your first aid kit, or if you need a vet to treat it. A flowing, shiny mane and tail are a joy to behold. Get that full, healthy look by being gentle and patient as you groom your horse's mane or tail. Either with a mane comb or brush, start at the bottom of the strands and brush downwards in sections until you can smoothly comb from the top of the mane or tail, right to the bottom. When brushing the tail, stand to one side and pull the tail gently over to you. This way you are out of the way should the horse kick. A grooming spray that detangles hair is nice to have and makes brushing out the long strands easier while cleaning, shining and protecting the hair. A grooming spray may also help prevent the hairs from tangling too much between groomings. Some people like to keep their horse's tails wrapped to keep it clean and tangle-free, but I prefer to let my horse use its tail the way nature intended, to swat away flies. If your horse's mane is unruly and lies on both sides, here's how to ​tame it to lay flatter. After currying the body to get rid of the coarser dirt, it's time to go to work with a body brush. This longer bristled, but still, a stiff brush will get rid of what the curry comb missed. With the body brush, whisk out the dirt brought to the surface. Start on one side and move around the horse brushing in sweeping strokes following the direction of the hair growth. Some people find the body brush is more useful for cleaning the legs than the curry comb. All the curves and angles on the legs make it hard to get the curry comb to do a complete job. So you can use the body brush, sometimes quite vigorously, to remove any remaining dirt. This is a good time to check for lesions and skin irritations on the legs, knees, and pasterns like small cuts and nick, or perhaps even problems like grease heel. My mother always joked that she never used a finishing brush because she never felt she was finished grooming her horse. Well, you might never want to finish, but your finishing brush will help bring out the shine on your horse’s coat. A finishing brush will have shorter softer bristles and may be used on your horse's or pony's face if you don’t have a special brush just for that. Gently whisk away dust from the broader areas on your horse’s face, ears and throat. With sweeping strokes whisk away any dust missed by the body brush. The finer bristles help smooth out the body hair and leave your horse looking more finished and glossy. When you think you are done, you can apply a grooming spray. Grooming sprays, depending on the type, can provide sun protection, and add shine to your horse’s coat, but they aren't necessary. If you plan to ride, however, then you must be aware that some products may make the hair slippery and could cause your saddle to shift. Try to avoid application to the saddle area. So far, you have cleaned up your horse’s body, mane, and tail. Now it’s time for detailing. With a damp sponge or soft cloth wipe around the horse’s eyes and muzzle, and clean away any dirt or chaff. You may prefer a soft cloth as it can be more easily laundered between uses. Check your horse’s eyes. A bit of tearing at the corner of the eye is not uncommon, but take note of excess tearing, redness, or swelling. Eye infections need to be treated promptly. Check ears for lodged seed heads or dirt. Some horses are fussy about having their ears handled, so go slowly and be careful not to pinch or pull hairs. Eventually, your horse may come to love having its ears groomed. When you are done with the face, use the cloth to wipe around the dock and tail head. Using hoof oil or ointment is a bit controversial. At best it does nothing beyond making the hooves look nice. Some people feel it prevents the hoof from absorbing necessary moisture; some feel it seals in moisture. Talk to your farrier to help you decide. Apply fly spray or sunscreen if conditions require. Some horses object to the hissing sound of sprayers, so go slowly and desensitize your horse gradually, perhaps using a bottle of water to start.